Makes it easy for both members and non-members to signup for an event volunteer position from the public website without logging into Portalbuzz. ​Volunteers can view filled and open volunteer positions. Event coordinators can manage the members and non-member volunteers, as the signups from the website sync with the signups created in the member portal. 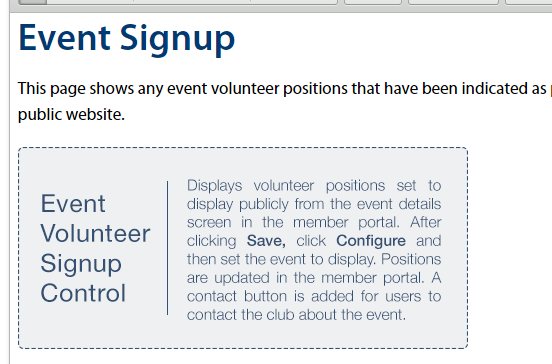 Below is an example of how event volunteer positions for an upcoming golf event will display on your public website. Why use an event volunteer signup on your public website? Some members don't log into the portal often -This feature makes it easy for members to signup for an event without having to login to the portal. Depending on the demographics of your club and how the members are using the portal, this option will help increase volunteer signups. Allow the public to signup for a position - Many groups and clubs have asked for this feature, so that they can easily allow non-members to signup for a position. Signup for groups that are not members, but are not "Public"
These are just some examples of how the Event Volunteer Signup feature can be used. 1. To get started, you need to make sure that you have an event set up in the portal. Click the link at the bottom of this article if you need information on how to create a new event. 2. Next, you need to add volunteer positions to the event that you set up in the portal. Click the link at the bottom of this article if you need information on how to create event volunteer positions in the portal. New! We've recently added a check box to indicate if you would like the volunteer position/s to be visible on the public website. You can always go back to the event area if you would like the position to be displayed or removed on the public website. 3. Once the event volunteer positions have been added, review the list to ensure that all details are correct. Click the appropriate check box to indicate if the volunteer position should be displayed on the public website. 4. Now that the volunteer positions have been set up in the portal, it is time to set the Event Volunteer Signup control on the public website. Go to the public website editor of the page where you would like the event volunteer signups to be displayed. On the member portal, click the Admin button in the navigation menu on the left. Under the Public website heading, locate Public website editor and click the Select button. Locate the Manage pages & menu heading and click the Select button. Select the appropriate page from the list and click edit. If you want to add a new page for the event volunteer signups, you can do so from this page. Click the Manage pages & menus article or video below if you need help in adding a web page. 5. Once on the page, click on the content box where you would like to add the list of volunteer positions, then click the Controls button in the edit bar. Select Event Volunteer Signup from the drop-down menu and then click the Save and Publish or Save without Publishing button. 8. Select the event from the drop-down menu, then click the Save button. Note: Only events with volunteer positions that have been indicated as public (at least one position) will appear on the list. 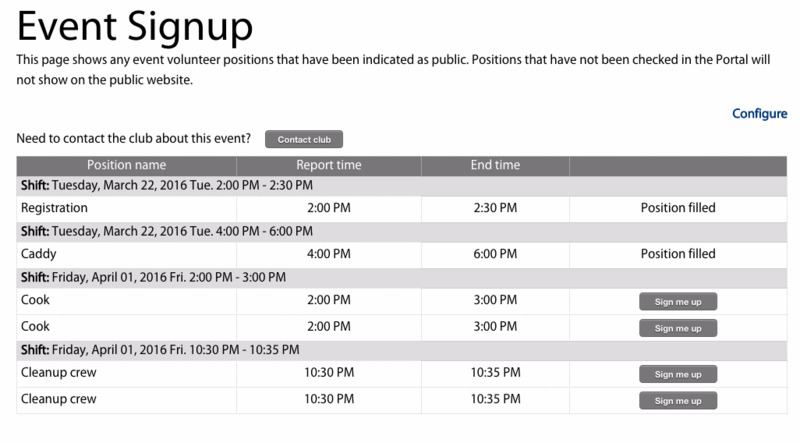 Events that have no volunteer positions set to public will not be available on the drop-down menu. The image below shows how the event signup page will appear on the public website. 9. You can make any necessary adjustments from the member portal or the webpage editor. Only future volunteer positions will display on the public website; past volunteer positions will not be visible on the pubic website. Members can signup for event volunteer positions either on the public website or in the member portal. Members must enter the email address that is on file in the portal in order to signup for a volunteer position. Names of members or non-members that signed up for a volunteer position will not be displayed on the website. The volunteer shift/slot will only display the words "Position filled". Volunteers that signed up will receive a confirmation email. 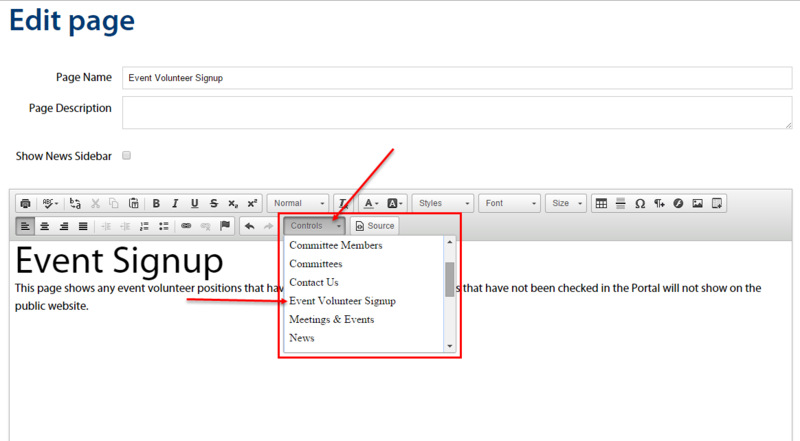 The confirmation email template can be edited from the portal by clicking Email in the left navigation menu, then Notifications in the red Administration bar, and selecting Event position signup, for volunteer. To cancel a signup, the person who volunteered should click the Contact club button on the Event Signup page of the website. A popup box with the Club Contact Form will appear. The person needs to fill out the form and click Send. An email will be sent to the Event Coordinator(s). Members can also log into the member portal to make changes on their sign up. 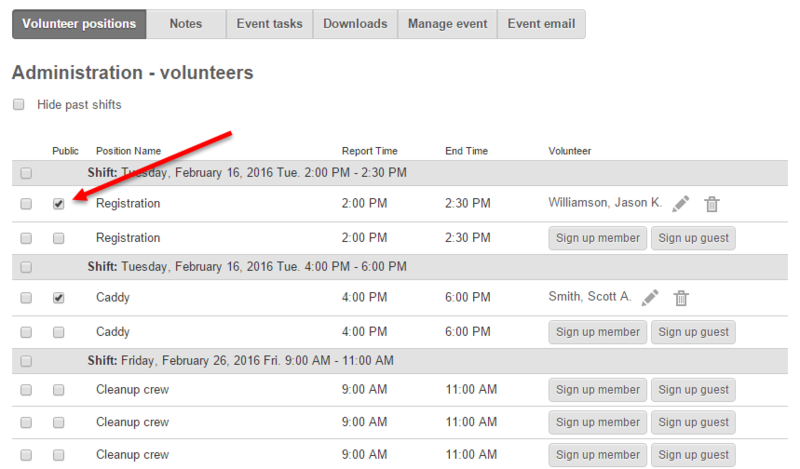 Any changes to event volunteer positions should be done on the member portal.